Summer is just over and it is the beginning of Autumn, so let me share about my spices and herbs growing activities during this summer. I had grown coriander (cilantro), mint, basil, chillis, ginger, fenugreek and turmeric, besides bay leaves and rosemary. Let me share about my spices and herbs growing activities during this summer. I had grown coriander (cilantro), mint, basil, chilis, ginger, fenugreek and turmeric, besides rosemary. In previous posts I shared about the growing of capsicums, eggplants, beetroot, curry leaf plant and taro and cucumbers, tomatoes and bitter melons. Summer is great time for growing herbs and spices. But this is also time to take care of various plant diseases that attack plants, although spices and herbs are relatively safe from various diseases and pests. Before planting the herbs, I mixed lots of compost from my compost bin and cow manure in the soil. I also applied liquid fertilizer during the growing time including comfrey tea. I sowed coriander seeds in Spring and enjoyed the leaves in various curries (how to grow coriander). We also used coriander and mint leaves in making chutney and used it with snacks. I grew coriander from the seeds collected from the previous year's crop. This year also I collected its seeds, dried and stored them for next season. My basil (Tulsi) plant in a container is about 10 year old and still doing very well. When the plant produces flowers and seeds, they fall in the pot and produces new plants, so the basil pot is ever-green. Actually, I can see several basil plants growing during summer in my different pots and ground at the junctions of the bricks because the seeds of basil are transported by air to different places. 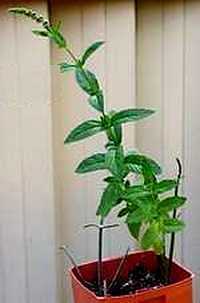 The basil plant is normally free from diseases and pest attack. In fact basil is a great plant that repels mosquitoes. We add basil leaves in tea to take advantage of its medicinal value and at the same time give tea a unique flavour and taste. Most of my chilli plants are in ground and some in pots (how to grow peppers). The plants were grown from the seeds collected from the chillies bought from the market. Chili peppers are very easy to grow from seeds, just bury some seeds of red chili in the soil and water. My chili plants are 3-4 years old and give me plenty of chillies, more than enough for my family. Every year I grow ginger in summer (Growing ginger). Ginger does not grow in a sunny place so I grow them in a Styrofoam container placed in shade. 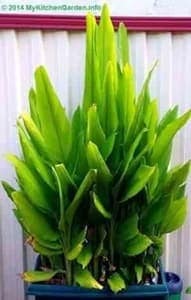 The plants are still young and will take some time be to use the ginger root. Last year, I planted 3 turmeric roots bought from the market, they were normal fresh turmeric. After a few months, they sprouted and resulted in 3 plants. Soon the roots in the soil started multiplying and new plants formed. When the green growth started to dry, I dug out some of the roots to use them in curries. I left most of the roots in the soil, which has now become a very dense growth. 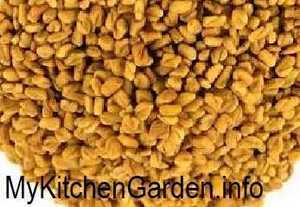 Fenugreek (called as methi or kastoori methi in Hindi) is very easy and quick to grow (How to grow fenugreek). 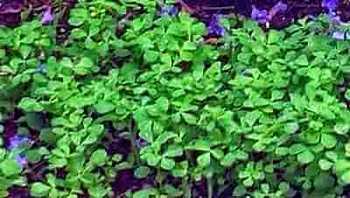 I grow methi leaves throughout the year because of their health benefits. I just put some fenugreek seeds in the top soil and rack them and water well. The seeds spread out in 3-4 days, or you can soak seeds overnight and sow them. I cut the leaves when they are 5-6 inch heigh. The leaves will regrow after a few days. You can sow new seeds when the plants die. In the above picture, the purple flowers are not fenugreek flowers, but these are flowers of Jacaranda tree in the neighbor's backyard.